Hyper Metal Sonic before his malfunction. 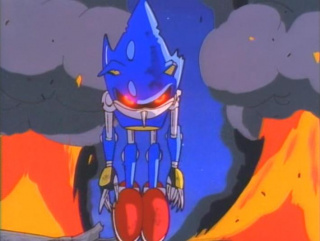 Hyper Metal Sonic is a character in the Sonic OVA which was modelled after Metal Sonic. He is a robot created by Dr. Eggman to destroy Sonic and help him conquer the Land of the Sky. He's infused with Sonic's Life data (personality and memories) to make him as formidable in battle as Sonic. Due to this he is also very predictable to Sonic and he's easily trackable to others who know Sonic well. The shared data between them also creates a bond and they can actually feel each others pain in a few instances. He serves as the primary villain of the second part of the film. He is voiced by Gary Dehan in the English dub. He's first seen floating motionless in a dark room somewhere in Eggmanland. He can't be activated yet as his AI isn't complete until he is infused with Sonic's Life Data. Eggman collects it from Sonic when he comes there attempting to shut down the Robot Generator. Just as Sonic starts running at Eggman, Hyper Metal Sonic blocks him. They start to fight and the fight becomes skybound. Sonic rests on a mountain only to be kicked off into the valley below. He then heads off and attacks the Land of the Sky before heading to a glacier which anchors the continents to the planet. Drilling a tunnel deep into this glacier will release a pocket of magma which will melt the glacier and cause the continents to shift and be hurled into the atmosphere. After creating a tunnel Sonic arrives and they continue the battle. The battle is more evenly matched this time and continues at a stalemate for a while until they crash into Eggman's vehicle. Sara falls out and is saved by Knuckles, the distraction allows him to get the upper hand. Sara tries to attack it to no avail, and he isn't stopped until Tails uses his navigator to overload his system by assimilating Sonic's personality. Sonic is quick to Spin Dash into it when he's freed and he is knocked over the edge of the cliff. The President's personal plane crashes nearby and Hyper Metal Sonic stands in front of it to prevent him from an attempted rescue. They start fighting again and Hyper Metal Sonic crashes through the windshield of the plane. Just before the plane explodes he rescues both the President and the Old Man. He starts to malfunction and falls over the side of the cliff and catches a hold of the bottom of the cliff before hitting the lava below. Sonic tries to rescue him but he pushes him away and says "There is only one Sonic" before becoming consumed by the magma. This page was last edited on 2 March 2012, at 17:53.